EAUC is committed to breaking down the silos in education institutions, organisations and companies - showing that everyone has a role to play in sustainability. From staff to students, the admin team to the marketing team, at all levels, in all departments - everybody can and should contribute towards bettering the world. This series highlights inspirations Sustainability Champions. It shows what this looks like in different roles and gives advice on how to be more sustainable. Do you know a Sustainability Champion? Recommend them to us as a case study and don't forget to nominate them for a Green Gown Award in the Sustainability Champion category. Our previous case studies from the 'Meet a Member' initiative can be found here. 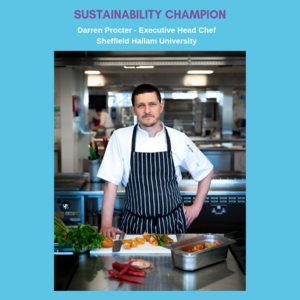 In the first of our new series - find out how an Executive Head Chef champions sustainability at a university! 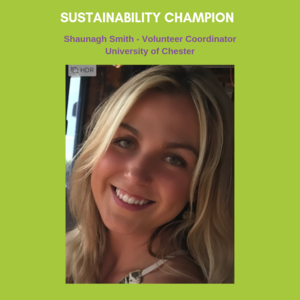 Find out about the social side of sustainability at University of Chester!